WebmailWorld Toolbar is a browser hijacker that will add a WebmailWorld Toolbar and will change the configuration of the major Windows browsers (Internet Explorer, Mozilla Firefox or Google Chrome). How can you infect with WebmailWorld Toolbar? You can download this toolbar from the company website that has developed. But the most common way you can finish installing WebmailWorld Toolbar is by downloading free software on the Internet, where this toolbar comes as an optional software to install. There are various websites like Brothersoft or Softonic where promote this kind of software in their downloads, so if you downloaded software of these or other similar web sites, you can finish with WebmailWorld Toolbar installed. You must pay attention to the installation of this kind of software because if you don't review the steps of the process installation you can install malicious software (PUP) on your computer. It is also common to be users of P2P file-sharing programs, you end with a file with this kind of software included. Or by receiving emails from unknown senders or spam emails where you have links to the program or attachments. If your detect WebmailWorld Toolbar in your browser, it's a sign that you are infected with a virus or malware. The manual uninstall of this browser hijacker don't clean or delete other malware you have in your computer. From Solucionavirus.com it's recommended to perform a full system scan and remove all detected threats. How to remove WebmailWorld Toolbar? 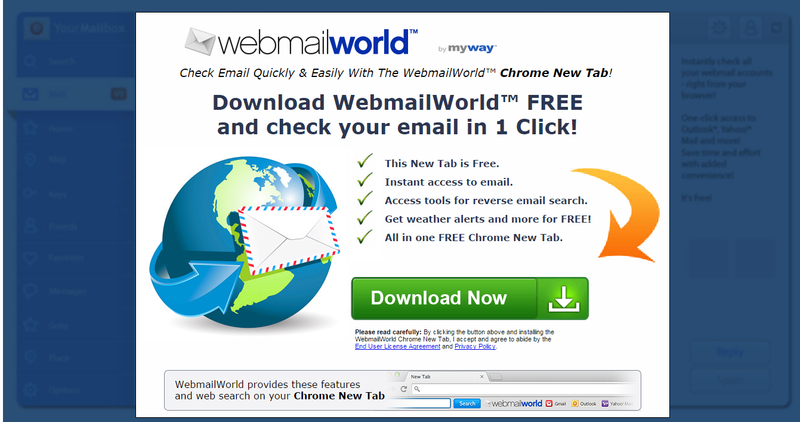 Note: All software used to remove the WebmailWorld Toolbar it's totaly free. These steps are tested and should remove this threat in major browsers. For successfully remove WebmailWorld Toolbar you must follow all the steps in the order shown. Manually uninstall WebmailWorld Toolbar or any malicious program installed on your computer. Go back Remove WebmailWorld Toolbar.